Arriving at the Corn hole event a bit later than I wanted to, careful planning worked. I had met Mark Frazier last year at a corn hole tournament that he held. When I approached him for assistance setting up and running the Sweet Dreams tournament, he was willing and eager. Come to find out, he works at Nibco, and was instrumental in getting the company to become a board sponsor for the event! Mark got the first round of the Corn Hole event up and running. When I arrived, camera in hand I started shooting photos and then tried to take a few moments to collect my thoughts about the rest of the day. The 9:30 round was booked solid, with full courts. It ended when Champions, Billy “Bobble” Lilley and Rob Allen, who just happened to be employees of Nibco, won the double elimination event. What a great feeling for Nibco! The next round was scheduled to start at noontime, so during the break between rounds I took the time to visit my own King Custom vendor booth . Walking up to view the rest of the event, WHOW, my daughter Melonie Skillman and employees Ammie Sprouse and Lauren Gouchenor absolutely floored me with the presentation of the booth. 20 to 30 people stood in line waiting to spin the “Prize Wheel”, and the three of them did an amazing job of interacting with the public, showing off our business. Hats off to you! The entire Sweet Dreams gathering had so many new venders it was amazing. The gathering of booths was so rich and colorful, I wish I had more time to take it all in, but I stayed busy all day. 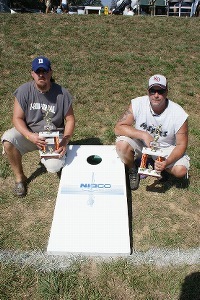 Mark helped set up the noontime round of the corn hole tournament, and then he & David Aistrop signed in as a team. Getting knocked out kind of early, Mark helped as long as he could before taking off for the day. My sincere thanks to him for helping make the first annual Sweet Dreams corn hole tournament a success. The noon flight was one team short, our decision was to let the previous champion enter, but with a different team member. So Billy “Bobble” Lilley teamed up with (another Nibco) employee David Coffey. The new team remained in the winner’s bracket all the way undefeated! Nibco won again! The last flight, at 2:30 also ran with lots of excitement. It’s obvious how this sport is becoming so popular. Participants included some of the 5k race runners, a family of four, a machinist, a farmer, a mother and son. Men, women and children- corn hole toss is truly a family fun sport!! With one team short going into the 3rd flight, we allowed Billy Lilley and Rob Allen (who actually came back to watch) to enter as a team. Lilley and Allen lost one game early on, and then came out of the losers bracket to challenge the undefeated team of Brad Dean and Brandon Bowman. On their initial show down, Lilley&Allen beat Dean&Bowman, creating a “play off” for the championship. Both teams now had one loss. Lilley&Allen just couldn’t handle the extra game. They fell apart. Whether it was the pressure to succeed, the heat, the long day, or just having met up with better tossers, we’ll never know. The overall winners for that final round were Brad Dean and Brandon Bowman. Great expertise was exhibited by all!! Great playing guys! Congrats! Certainly a good time was had by all who participated. I’m really looking forward to next year’s event. Hope to see you there!